The Mach Effect was hypothesised by James F. Woodward, who proposed that energy-storing ions experience transient mass fluctuations when accelerated. Unlike conventional technologies, drives based on the Mach Effect do not need to release matter in order to generate thrust. Woodward explains that these transient mass fluctuations are caused by relativistic effects. These fluctuations can then be used in what are known as "impulse engines", which do not contain any moving components. Woodward tried to prove this theory by stating that a capacitor’s mass changes with its charge. He substantiated this by explaining that the underlying cause of inertia is the gravitational force of attraction of all masses. As such, if we were to oscillate an object in a path, and in the process vary its mass, (for e.g. the mass is higher in one direction of oscillation and lower in the opposite direction), then there exists a net force in one direction. This is because the inertia of the object changes as its mass changes. Woodward conducted an experiment which uses the Mach Effect to produce a "pulsed thrust". Woodward claimed that it is possible to "produce a measurable stationary effect" if we were to couple the mass fluctuation to a "synchronised pulsed thrust". The figure on the right illustrates the set-up Woodward used for his experiment. The mass fluctuation required in the capacitor array is produced using an AC voltage. The piezoelectric force transducer then reacts to this and hence causes the capacitor array to oscillate in a synchronous manner. It follows that the reaction force, FR on the piezoelectric force transducer and the external casing is simply Newton’s 2nd Law of Motion. Should we find that the fluctuation in mass and acceleration of the capacitor array are sinusoidal and have a constant phase relation, then it follows that FR is a stationary effect. 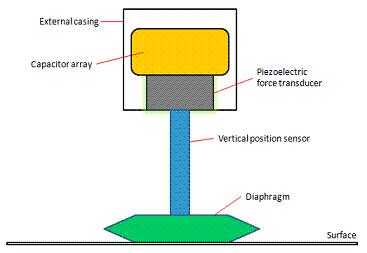 To measure FR, the set up is placed on a shaft with a vertical position sensor which allows measurements of the instantaneous mass of the capacitor array. From the graph on the right, we can see that during the period of time when the set up is activated (7–12 seconds), there is an obvious mass fluctuation. Woodward also found that this result is not produced when the capacitor array and piezoelectric force transducer are not working together. Thus, Woodward’s experiment does present a strong case for the Mach Effect to be possibly used to produce thrust, and subsequently in rocket drives. We now evaluate the performance of this technology using results from Paul March's Mach-2MHz experimental set up. Firstly, the lifetime of the set up just lasted a few minutes, which offers the first stumbling block to being a feasible rocket drive. Secondly however, the results from the experiment showed a very high specific impulse, of IESP = 13.62×1012 s. This is superior to that of the Space Shuttle's main engine (SSME) which has a specific impulse of 454 s. Thirdly, the thrust-to-weight ratio of the set up was a mere 7.44×10-4 compared to that of the SSME which has a ratio of 73.12. Finally, we seek to evaluate the possible trajectory of the technology. Results are unconfirmed as yet, but it is proposed that for a 1 g constant acceleration, the time taken for a Mach Effect based rocket drive to travel from geosynchronous orbit to the Moon takes about 4 hours. a) Frequency of oscillation is limited to the kHz range (considered slow). b) The UFG is known have an acoustic destructive wave interference problem. Thus, Paul March has proposed a newer design, termed the Mach Lorentz Thruster (MLT). It aims to solve the interference problem and does not have any moving parts. Here, the role of the piezoelectric transducer is replaced by the electromagnetic response of a magnetic field on a moving charge (Lorentz force). This force will be synchronised with the fluctuations of the capacitor voltage, consequently allowing us to maintain a consistent phase difference between mechanical forces and energy. However, results are not impressive mainly due to the fact that March’s MLT design did not produce acceleration for the whole set up. Research and development on MLTs continues. If the apparent mass of the oscillating capacitors become negative, their direction of inertia reverses compared to normal gravitational matter. This can subsequently be manipulated to open up a wormhole or even an Alcubierre spacetime warp bubble which can allow space travel faster than the speed of light. The first problem would be that the Mach Effect appears to disobey the Law of Conservation of Momentum. Woodward rebuts this claim by explaining that since inertia is due to the mutual gravitational force of attraction between any masses, then any system that allows variations in mass to change inertia and hence produce acceleration is using the "mass of the Universe as the reaction mass". From this point of view, the Law of Conservation of Momentum is obeyed. In theory, the Mach Effect does introduce new possibilities in rocket drive technology. Much research and development therefore has to be done and rightly so, since the theorised benefits are potentially significant. Yet from March’s experimental results, the performance of existing Mach Effect set ups is far inferior to current rocket technology. Thus the results are still inconclusive on whether these theorised capabilities are actually achievable.